Now that we’ve all had a chance to marvel at the wonder and beauty of The Dress, the real question is, will I fit into it in time? A long entry about what happened in the last eight weeks is under the cut. I’m considering joining the YMCA. Okay, done singing the song? Moving on! My preferred form of exercise is running. However, it’s a billionty-eleven degrees outside, give or take a degree. My internal thermostat has always been a little wonky, and it hasn’t gotten any better now that I have an insulating layer of blubber to protect me in arctic waters. When I go running and it’s over, say 80 degrees Fahrenheit, I walk away from it feeling drained, which is the opposite of what usually happens. The Harris Y has an indoor track and isn’t that far from my house. Plus they have a really great set of indoor pools which would be nice to bring Em to on those days when it’s sweltering or the ozone is bad, which is most days so far this summer. It also has outdoor tracks and pools, good workout facilities, and a range of classes in case I go insane one day and decide I need to learn how to dance hip-hop. That would also get me membership at the Harris Y Express, a smaller branch that is closer to my house. No indoor track, but a treadmill would do in a pinch. Local folks, anybody got any experience with the Harris Y, positive or negative? I’ll take answers online or in person when I run into you. Thanks! Sorry for the lack of updates. As I wrote, I’ve been ill. However, I finally went to the doctor and got some antibiotics that seem to be having an effect. My cough is decreasing and my energy level is increasing. The trick now is to not overdo it. I didn’t get quite enough sleep last night (sorry, Mom) so I’m running at about half speed today. Still, hats are being knitted, and I hope to start to work through the insane backlog of Jayne hat e-mails that have piled up while I’ve been sick. Had a little dyeing shindig on Sunday, which was great fun. People produced some really interesting stuff. Much of it was overdye of unfortunately colored yarns, all of which were improved. Alas, I took no pictures. 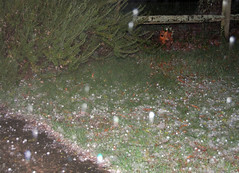 As you can see, I did take pictures of the hailstorm we had two nights ago. It also knocked a tree onto the roof of my old workplace in Belmont, NC, as well as ripping up a couple of smaller satellite dishes and sending branches crashing through a window. The NYMag site ran a cute little photo slideshow featuring the various factories that the president has toured called “A History of Obama Feigning Interest in Mundane Things”. Comic artist Dean Trippe revealed the truth behind this in a hilarious (to me) Photoshop series of his own called Barack Obama Looking at Awesome Things. (Also at his blog.) It made me grin. If this seems a bit disjointed it’s because the longer I type, the sleepier I get, so I think I’m going to try to get a nap so I can be fresh for D&D tonight and ready to whip up more Jayney goodness for my waiting Browncoats. Last night I dreamed that I auditioned for a part in a stage musical. My voice was very good, but after the song, I realized that given my current weight, I really wasn’t right for the role. When I have a dream about my weight, it means that my subconscious realizes that I’ve gained a little, whether I know it consciously or not. I weighed myself this morning for the first time in weeks, and sure enough, I’m up almost one pound. It’s not terrible, but it’s not the direction I want to be going in, either. I’ve been sick, and because of that, I haven’t been exercising. Without much energy, I’m turning more to comfort foods. My comfort foods aren’t exactly celery sticks and rice cakes. 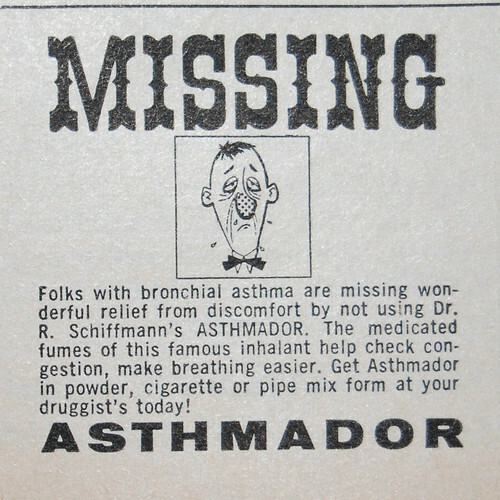 I don’t have much energy and I still have a cough, but really, how bad is that? This time last week I had a raging fever and couldn’t breathe through my nose. Am I resting just because I need the rest or am I also doing it because it’s easy? When I start feeling like I don’t have much energy, an image sometimes comes to my mind. It’s of my mother, when she was in chemotherapy (she’s fine now, it’s not that kind of story). There was something we needed from downstairs in her house. I would have been happy to get it for her. Her husband would have been happy to get it for her. But she plowed on down the stairs anyway. As she was climbing the stairs from the bottom of the house back up to the top, she had to pause a couple of times to catch her breath. It wasn’t a long staircase, but the chemo reduced her iron levels and she physically didn’t have the energy to continue for a moment. But she still went down the stairs, and she still went up. Now, I’m not my mother, and I don’t think I have to do everything she does. I don’t think she’d want me to live my life that way anyway. But the fact remains, I saw her go up and down those stairs. She was poisoned, but she kept living her life as best she could. Because what else can you do? All I have is a little low energy and a cough. I think I can walk up the street. It’s time to get out and do it. I need to live life. Because what else can I do? 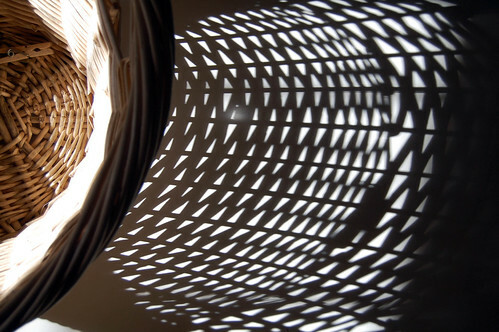 The morning light came in through the kitchen window, hitting the laundry basket just so. I had to take a picture before loading it up with clothes. It’s an absolutely beautiful day, and I am not happy to have a lingering cough that keeps me from running. Still, I’m not forgetting the first part of that sentence: it’s an absolutely beautiful day. I seem to have picked up allergies or a cold or possibly the plague. Okay, it’s not the plague (probably) but it comes at a very inconvenient time. Today is Em’s birthday. Friday, we have a party for somewhere between five and a dozen kids. We invited nine, but a couple have asked if they can bring siblings. Nobody else has responded. The kids are not big with the RSVPs. So I had been cleaning earlier in the week and planned to keep it up this week. Instead I’m totally exhausted from lack of sleep and my temperature is stubbornly parked at about 100F. I called someone to come help with the cleaning tomorrow. If I’m feeling better, that’ll mean I can focus on de-cluttering while she gives the place some spit and polish. If I’m not feeling better, a lot of stuff is going to get shoved into the bedroom. Either way, I still have to do the basics, like pick up a pinata and figure out how we’re going to transport everyone if all twelve kids show up. At least by Friday I should no longer be contagious. Oh dear, did another day go by with no post? 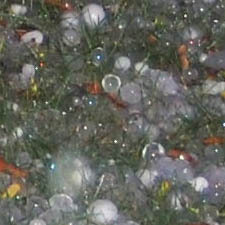 Shall I post some random content, like How To Put On A Sports Bra Roger Ebert does tweet some interesting stuff. A followup to “my baby my baby, she’s so big!” from the other day. Em had a routine doctor’s appointment today, and she’s in the 75th percentile for both height and weight. However, the doc predicts she’ll probably top out at about 5’6″, maybe a little taller, so probably she won’t be the Glamazon that always seems possible when she’s outgrown yet another set of clothes. Also, the doc thinks her feet are nearly done growing, so she probably won’t inherit her father’s size 15 clodhoppers. So, all things being equal, she probably won’t be shopping in either the petites or the big’n’tall sections of the store. That’ll make life easier, at least. Em was very brave at the doctor’s office. She had to get two vaccinations, which she absolutely hates. We practiced, and she told me on the way over, “I am not going to cry or scream.” I wasn’t going to hold her to that. Her terror is very real. But she was holding it together very well until they also said they were going to do a finger prick. I hadn’t prepared her for that. But you know, she still kept it together. She was very, very nervous, but she didn’t cry or scream. I was extremely proud. She got a lollipop from the doctor and decided to keep it until after school. She put it in the pocket of her skirt and said she was going to show it to her friends. Unfortunately, after school I did a laundry with that same skirt. By the time Em realized what had happened, all we found among the laundry was an empty wrapper and a stick. Em hadn’t had a very good day that day, and this was kind of the capper. Did I mention how good and brave she had been? She really did deserve a reward. 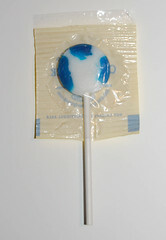 After my husband got home, I went back to the doctor’s office and begged another lollipop, same flavor. Em was very pleased, and therefore I was pleased too. My kid’s a big girl, but she’s still a kid. And I’m glad. Em came home from school today sniffling, saying, “I feel different.” She was running a small fever. She settled in on the couch and I poured her a cup of orange juice. Then I went off to go through her backpack to be sure there were no notes from the teacher. Afterward, I went back into the kitchen, picked up a cup, poured myself some water, took a sip, and froze. The water tasted like orange juice. My sweet daughter, who always wants to be good, had taken her cup into the kitchen and put it on the counter to be washed, as was proper. And then I drank from it. Actually, I hadn’t swallowed, so I spat it back out and rinsed my mouth with Listerine. We’ll see whether or not I get sick. If I do, I have only myself to blame. This morning on my run, I brought my camera. I wanted to take a few pictures of the Greenway before I got started. 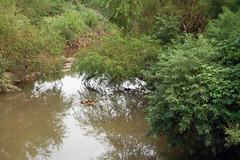 This picture was taken from the bridge on the section behind Park Road Shopping Center. 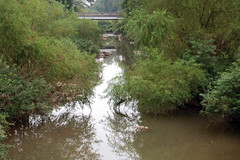 You can see how peaceful it is, and why it’s pleasant to run or walk there. Note also the turtle. This was taken about 9:30. I put my camera away and went running. 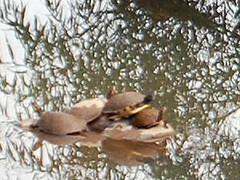 On my way back over the bridge, I noticed that the turtle had been joined by a second turtle. I thought that’d make a better picture, so when I got back to the car, I got my camera and came back to the bridge. Holy turtle soup, Batman! Two turtles had turned into at least five. 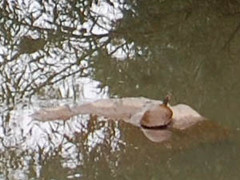 Clearly, this rock is the happening place to be if you’re a turtle along this stream. It rained a bit last night, and the stream was higher than usual, so I have to assume that’s why they’re all crawling on top of each other. It might be some kind of “Shells Wide Shut” kind of situation, but I think it’s probably just about having a prime sunning spot and not wanting to give it up to anybody else. What I want to know is, why this rock? There are plenty of others. This one must have some kind of cachet with turtles that I as a human cannot see. Just after I shot this, the little one on the right slid back into the water. I guess it didn’t have a reservation.